Joe and Chante’ Cepeda are disciples of Christ who lead the Deaf Ministry at Mission Point Christian Church in San Antonio, TX. 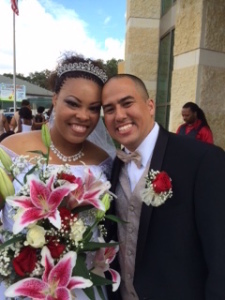 They were married on October 19, 2014. Joe is deaf and is fluent in ASL and lipreading. He has been serving in the Deaf Ministry since 1997. Chante’ went to school to become a Sign Language Interpreter in 2004. In 2008 she began a Deaf Ministry in the Milwaukee Church of Christ teaching anyone who wanted to learn how to communicate in ASL. Together, they wanted to create a place for other Deaf disciples as well as those who would one day like to learn and communicate in ASL. People from around the world can now have easy access to training materials, encouraging stories, contact information, and fun learning tools for other disciples in Christ. Browse through the site and check out all of the new and fun things about the Deaf Ministry. Add a story, read about the Deaf Culture, learn how to sign one of your favorite kingdom songs; just have loads of fun as you venture into a different way of building a relationship with our Lord. Enjoy!